Ali Dey Daly is a surprising, engaging young man with bags of talent. He has been able to turn his trade into an art form that he totally understands, cherishes and develops, completely at peace. It was when he was 14 that this young man’s adventure officially began. At the time, he was a student at secondary school, and he decided to give that up after a long conversation with his parents, to do a vocational cooking course that allowed him to work in Tunisia. 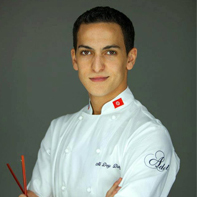 When he was 15 he embarked on his first cookery traineeship in Tunis and was trained by the capital’s best-known chefs. At the age of 18, he applied to the Institut Paul Bocuse in Lyon. That was when the real challenge began!